I have been really interested in liquid lipsticks for a while now. They are everywhere and will update your makeup bag in an instant. I have started experimenting with them but still find the concept quite strange. First of all, applying them without making mistakes is a nightmare, I’m talking liquid lipsticks in general. Their consistency is the same as a gloss and much more pigmented so in so many ways it’s easier than applying a lipstick on the go, but you have to really be careful. Despite this, I actually really love using them as they remind me of my early makeup years, the days I used to wear lipgloss. Also, I love wearing matte lipstick but find them drying and discovered that liquid lipsticks are much more hydrating, lightweight and have a better finish. If Huda Kattan likes them, then I am sold! 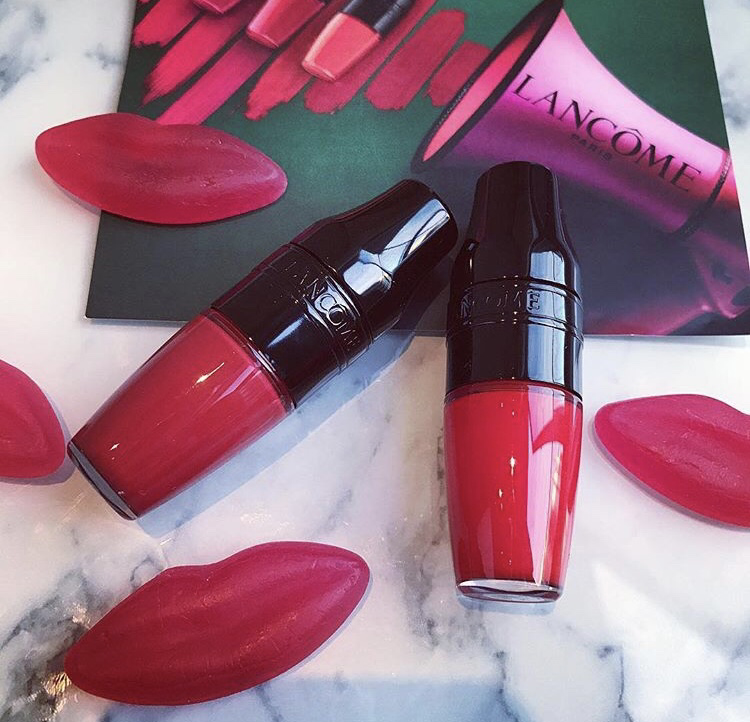 The Lancome Matte Shaker liquid lipstick is the latest liquid lipsticks I have been trying out. These are super cute little pops of very intense and highly pigmented lipsticks that come in 7 vivid colours. The lipstick is formulated using silicone oils, a water-in-oil emulsion which leave a lightweight second-skin feel on the lips and the best part is, they are non-transferable. The two colours I have are are RED’Y in 5 which is a vibrant orangy red and KISS ME CHERIE, a darker and deeper red. Both colours are great for this time of year, whether you’re looking for a bloody red for Halloween or a festive one for Christmas. I actually wore RED’Y in 5 over summer too and it looked incredible with my tanned skin. Okay so the lipsticks are so cute and super easy to use. All you do is shake the bottle in order for the liquid to saturate the sponge on the applicator (below) and apply to the lips. Obviously shake while its fully closed and shake it hard. I had to tap one of mine against a table top to release the liquid. This is actually a good thing because once shaken, you don’t want its pour out every time you open it. In fact, you have to shake the bottle pretty much every time you want to use it. Sometimes, only the oil comes out which is nice when you don’t want full on red lips on a Sunday morning… know what I mean?! As you can see below, the applicator is a medium thick pointed, firm velvety sponge which helps with the precision… basically to stop you applying it all over your face. Again you have to be careful as it does miss the lip line if you’re not careful but after a few tries you will get used to how to apply it and in fact, when I came into work today with it on, my colleague asked how I got my lips to look so precise. Once applied the formula comes out really watery and quite oily like I said earlier and more like a lip stain or oil. This means you have to give it good shake, or whack it against the table. If you haven’t got enough product on the sponge applicator, it will gently stain your lips for a daytime look that I love, but for more intensity, keep on shaking baby and omg the results are amazing! Once applied the lipstick will cover your lips and be super wet. This is the part when you have to be really careful. Don’t kiss anyone, drink or let any hair strands near your lips… don’t go out in a storm. So, after around 5-10 minutes, the lipstick will dry to leave a matte finish. It is not the kind of matte as you would expect because its not heavy and dry. The colour is intense, yet it feels like a second skin, its amazing! I am supposed to hate this lipstick because a little shaking pot of wet matte lipstick sounds wrong. The truth is I actually really love it! I wore red lipstick to work the other day and unlike my normal lipstick, this didn’t move at all and didn’t even transfer onto my coffee cup… I mean it did, but not as much as my usual lipstick. I also wore it to a party last night and put it on all hot and bothered after the gym and during the party and it felt so cooling on the lips. It comes on amazingly and I even applied it in the dark (at the party, not the gym) and there were no mistakes. I love the packaging and really enjoy putting them in my makeup bag because they look cute and they are super compact. Next Winter is coming – Rodial Pink Diamond and Dragon’s Blood Face Masks are here to help!